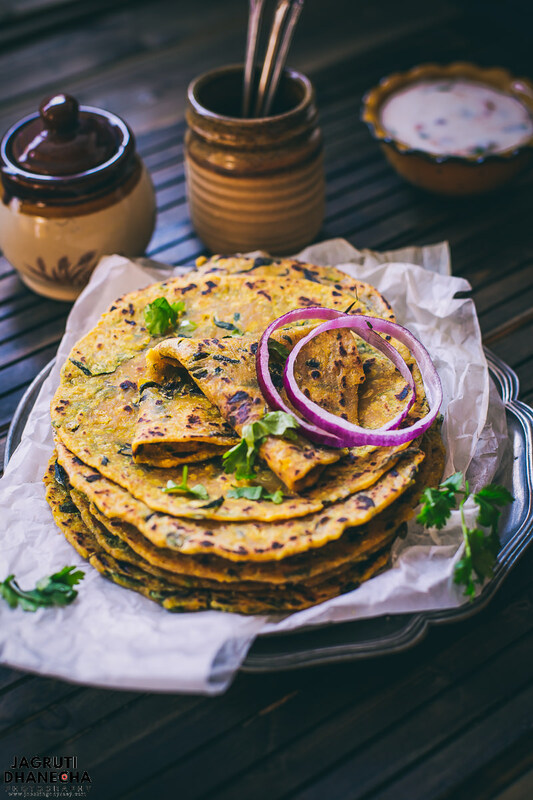 How to make Dal/Daal Methi Paratha | Dal Methi Paratha or lentil and fresh fenugreek pan-fried Indian flatbread are delicious and flavourful yet so easy and quick to make. This recipe is prepared with wholewheat flour, cooked lentils and fresh fenugreek. It is a healthy and wholesome and is perfect for breakfast, brunch or lunch box that can be served with plain yogurt, raita or pickle. If you are preparing during winter or monsoon season then must try these with Indian Masala Chai. Cooked breakfasts are equally as big all around the world. I decided to make these Dal Methi parathas for breakfast when I had leftover Mug Ni Chutti Daal, and being a huge methi fan I decided to add a large amount of fresh methi leaves. I also added the garlic puree as I made these over the weekend, and no one in the family had to go out. NO we don't eat any breakfast with onion or garlic if we are going out. 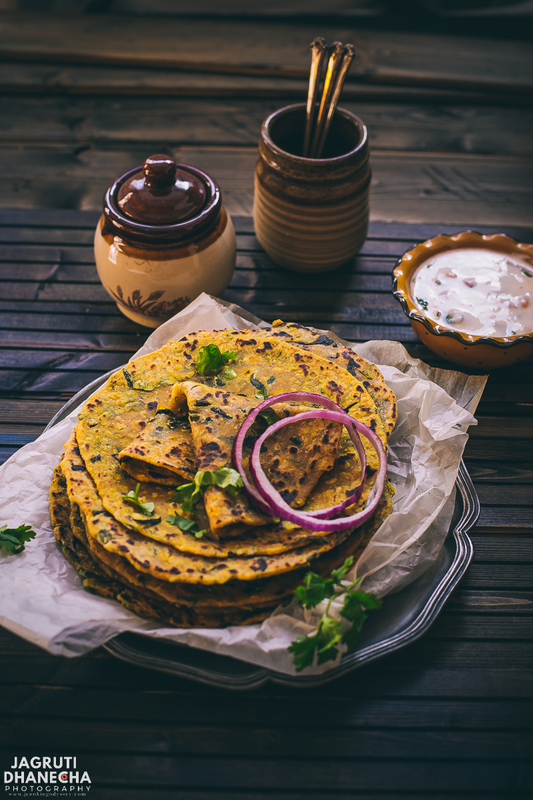 Usually, most of the Dal paratha recipes uses liquidy dal, in my recipe, I have used dry dal but it does not make any difference to taste or texture of the paratha. As Mug Ni Chutti Daal is not cooked with heavy spices, you can adjust spice levels of this dish by adding extra spices. These parathas should be best consumed on the same day as these are prepared with leftover dal. Indian pan-fried flatbread cooked with cooked lentils and fresh fenugreek! In a big bowl place all the ingredients except oil ( for shallow frying ) and mix well with your hands. Add water little by little and knead a pliable dough. Cover the dough with a clean kitchen towel and rest it for 10-12 minutes. When you are ready to make paratha, once again knead the dough for one or two minutes. Then divide the dough into equal size and make round balls. Dust the flour on the working surface, first roll one ball into a circle. Place a rolled paratha on the griddle and cook for 20-30 seconds or until the top starts to brown and slightly bubble. Turn the paratha over using a spatula, apply little oil and continue cooking for about 30-40 seconds or until dark brown spots appear. 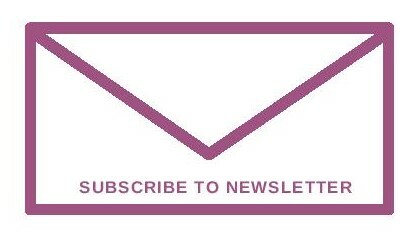 Flip it over one more time, and using the spatula, apply oil. Carefully press down all over. Serve hot with raita or plain yogurt and pickle. I really enjoyed with masala chai. Vegan use lemon juice or dry mango powder instead of yogurt. You can use other greens like spinach, dill or amaranth. You can omit garlic puree if you like. loved the way you used the leftover cooked dal to make these healthy and yummylicious parathas, my mother in. Law also does the same sometimes but doesn’t add methi , thanks for the lovely idea will try this next time for sure. I do parathas with leftover sambar and i know how delicious these parathas will be. WHat a lovely addition of methi here. And those parathas looks just prefect to enjoy even without any side dish. 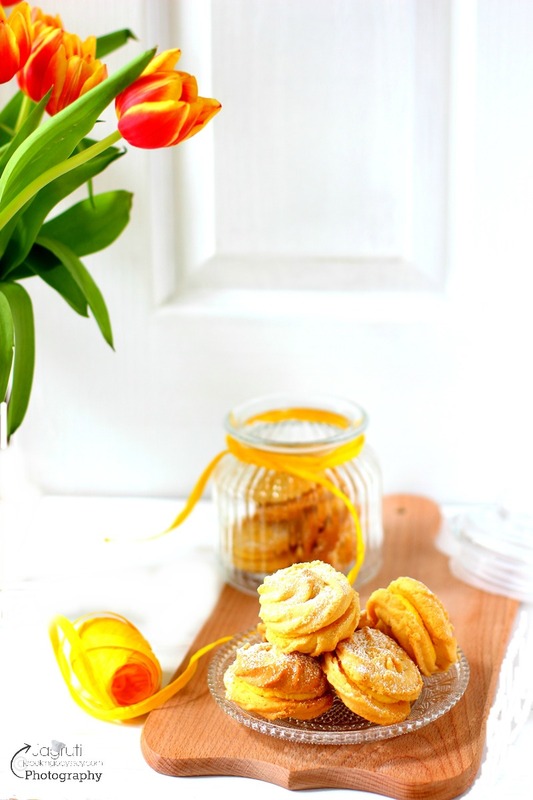 That stack of gorgeous parathas looks so delicious, especially with the beautiful photography! This is one wholesome treat! All I need is some pickles to smear, roll up and devour! 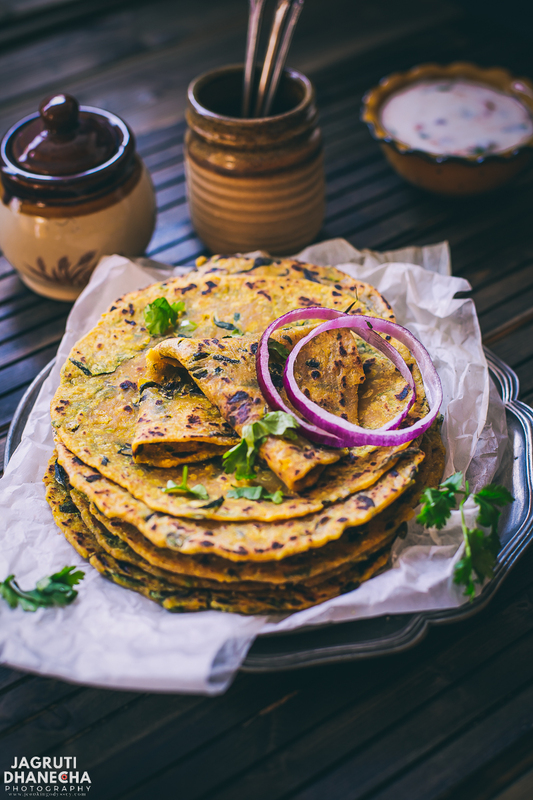 These dal methi paratha are so nutritious, they look yum. Perfect with some dahi and pickle or just masala chai as you have mentioned! Every time you post a recipe, it not only makes me drool, it tempts me to collect these beautiful jars and bowls you add these wonderful creations to. The recipe is yet another comfort... perfect treats they are. I will cook extra dal just to make these parathas. Yummy share. 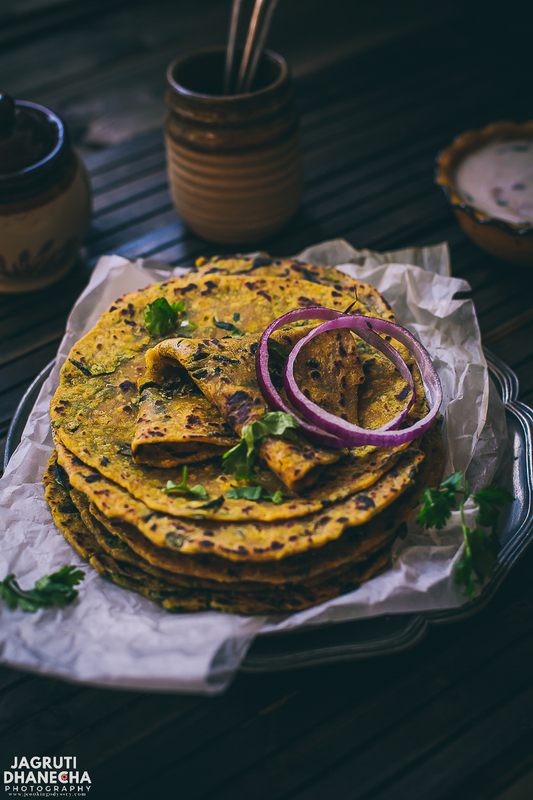 This dal paratha with greens is one of the best ways to convert a leftover into a flavorful dish.Abd your amazing pics make me drool Jagruti ! dal methi paratha looking perfect and so mouth watering. lentil and green mix together in paratha is just awesome. Loved your idea of incorporating dals and fresh greens in our diet.These paranta looks so crisp and delish. Fabulous share .